The monthly report NOAA never produces – from the Climate Reference Network | Watts Up With That? Here is the latest monthly value from the state of the art Climate Reference Network, (CRN) which never seems to make it into NOAA’s monthly and yearly climate reports. But, I produce these maps now monthly since NOAA doesn’t. 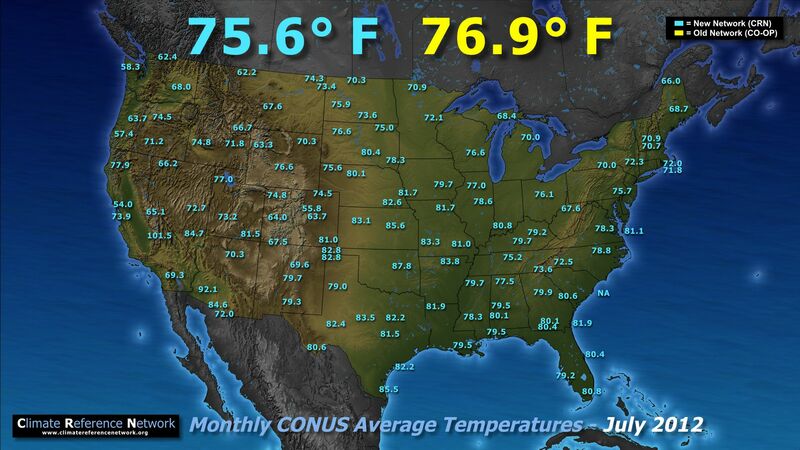 You can see NOAA’s monthly report here. Before our alarmist readers get too carried away with the revelation of the CRN network being a bit warmer, you should check the map just below this one. Click the map to enlarge – The yellow number is from the most recent NOAA SOTC report from the older Cooperative Observer Network while the blue one is from the CRN data that I ingest and calculate regularly now. The second map is from July 2012. Notice that the network averages have flipped in relation to one another. I’ve noted this flip happens every year since 2008 (when the CRN was completed and the year with the first full data set). There’s a physical explanation for this. Do you know what it is? I’ll leave you to figure it out in comments. I’ll have more on this new CRN resource next week. The source data for the CRN is here. With the millions in taxpayer money spent to create the new state of the art climate monitoring network, you’d think they would report the data to the public along with the monthly and yearly SOTC reports. Only when it confirms their bias. The full CRN as you know has multiple stations in Alaska and two in Hawaii. Since Alaska is dead-center in the polar regions where the warming is supposed to be most intense, it would certainly be important to keep an eye on it. Would it be very difficult to add these (one or two separate maps) to the CONUS maps? (I originally thought CON was Continental, in which case Alaska would be in (and Hawaii not), but then I saw that CON was Contiguous). Still may be confusing for some. @Lance, I will at some point, but I have more pressing work to complete first. Greater number of high altitude / high latitude stations create colder avg in winter w/coop net? Poor siting conditions create warmer avg in summer w/coop net? Example: difference between San Jose and Reno in the summer can at times be negligible. In winter the difference is often dramatic. Poorly sited station will have potentially greater warm bias when sun angle is higher causing more heating of adjacent man made surfaces. CRN wouldn’t have that problem. Completely understandable and I hope some of that pressing work will be your new article. I have sent you an email (mentioned here, in case it gets buried in all the others) with an idea for a small research effort that I might carry out if it seems to you to make any sense. I’ve noted this flip happens every year since 2008 (when the CRN was completed and the year with the first full data set). There’s a physical explanation for this. Shadows? The poorly-sited stations tend to get less sunlight heat in winter, and more sunlight heat (and air conditioners) in the summer? The sun is able to reach over obstructions better in the summer? Multiple readings per day instead of the average of two (more of an area under the curve / integration approach)? If this is the case, you would still be able to produce good correlation with the old dataset (using min and max only). I suppose that is not a physical reason though. Using a better SW radiation shield from the top but not an equally good LW shield from the bottom might produce this effect. I was thinking sensor mass / time constant, etc, but that would only serve to increase the min and decrease the max. Average would probably be less affected, though not immune since the wave is not pure sine. More people taking vacation during the summer months. Therefore more jet exhaust warming stations. So there is most likely an assignable cause. What that is? I have no idea.Sorry I can’t contribute anymore without knowing what the changes were between the old and new measurement systems. I’m guessing that the summer/winter COOP/CRN difference is due to sun angle, as Crosspatch suggested, perhaps because some poorly sited COOP stations are shaded by objects (trees, buildings) from the south with a low sun angle but not with a high sun. Question – don’t the COOP & CRN stations have maximum & minimum thermometers? If so, wouldn’t the average of the daily maximum & minimum be more accurate than averaging 3 or 4 observations during the day? I know nothing about thermometry and little about instrumentation so hopefully these are not dumb questions. Ah well, as roy spencer points out you can’t compare different networks using ABSOLUTE temperature unless you account for the differences in sampling: like altitude. The alternative is to use anomalies and then you’ll see no statistical differences between the networks. Seems to me it is as simple as UHI being more pronounced in the summer than the winter. Poorly sited stations are situated too close to pavement (which heats up way more in the summer than the winter, particularly if it is snow covered in the winter), being too close to air conditioning exhaust and cooling towers (also likely to be used more in summer). I can think of a few other factors (some which would lean the other way) but my guess is siting issues are more pronounced the warmer it is. Sometime ago you posted a graph made from the data of 600 well sited rural stations which had never missed their monthly reports. If it’s not too much trouble I think that would be good to include with these monthly reports except it would always be 2 months behind because of the time it takes to integrate the hand written reports with the total data set. Excuse me, but I think that NASA has a serious priority problem. We note the temperature issue, but there are others as well. NASA needs to be shaken by the heels to pay closer attention to real needs in its scope of practice. 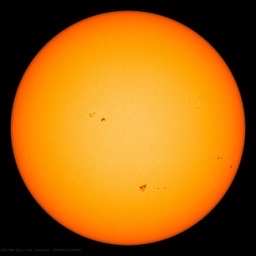 Maybe we should let the UN take on solar weather, perhaps our NASA should get out of the climate business and focus on space. What in its power can it do that is productive to affect an object, only recently discovered, that is within a 30 minute delta of actually hitting earth. We are looking at 11:24 AM PST on 2/15/13 regarding this very, very, newly discovered very near miss. So NASA is calm? NASA has become a joke. Another impressive leap of faith. Probably as simple as less urban bias in the new network. UHI is predominantly in summer. The temp differences would give an average UHI influence in the old network of about 1.7C, which is a lot higher than climate science claims. So if it is UHI, this is quite a find. My CRN calc for 2012 was: 55.25°F and that matched what Maue got from NCEP 2 Meter temp too (55.27F). Anomalies can’t be done on the CRN since there’s not enough time period to calculate a useful baseline for the CRN, unless of course you are making the absurd suggestion that we use the baseline from the old COOP network for CRN anomalies. One thing this demonstrates is that the last digit in the “US average temperature” is not significant but rather meaningless. The new networks have a lower reading since Anthony embarrassed them into using stations that are not biased to be warm. I can only hazard guess that it has something to do with the difference in angularity of the sun from summer to winter. Consequence of time of observation and day light savings time ? Could the temp differences be due to the fact that the thermometer enclosures in the newer network use forced ventilation? Sampling period not the same ?! Zero-order hold noise due to sampling period cause a delta temp dependant on temp slope around that mount ?! From the August 30th WUWT posting, is the difference an artifact of the way each day is averaged? CRN averages multiple readings and COOP uses min/max. The COOP and ‘happenstance measures’ are a wash, completely unusable. That was the conclusion to a report of some now 30 years ago and that report was cited recently. And this conclusion applies to all ‘near surface land born temperatures’ from 1800. I.e. ‘Temperature’ is not what many, then and Now, think it is ! Is the difference due to Coop Net. being the average between just two data points, Tmin and Tmax, whereas the CRN averages many data points throughout a 24 hour period. In turn, would the flip between summer and winter be because those two seasons have different temperature curves? To start with, CRN has 115 sites while COOP has 1218. However, the CRN sites seem to be evenly distributed across the CONUS area, while the COOP sites are clearly concentrated in some areas more than others. COOP may be more influenced by coastal proximity, Great Lakes, and Southern bias. Hm. At a guess, I’d suppose that the difference is due to the relatively poorer siting of the COOP leading to larger temperature swings, thanks to siting of COOP locations in environments with (effectively) low heat capacities (think concrete vs. grass, unsheltered from wind and sun vs. exposed, etc.) The more poorly-sited locations should respond more dramatically to temperature swings than the well-sited, well-maintained locations–and that would include the grand temperature swings of many months that we call summer and winter. In winter the COOP network is poorly sited close to very cold external sources causing heat to radiate away from the temperature station thus lowering its reading. In summer the poorly sited COOP stations are located too close to high temperature sources which cause radiation to increase station temperature readings. The “Pine Tree Effect”. The CRN stations are located out in the woods where there are more pine trees which are excellent at absororbing the sun’s rays. The COOP pooly located stations are near larege open areas covered with snow which reflect the sun’s rays. I’m going to go with something to do with daylight savings time queering the reading times. Steve Mosher: Lately I’ve noticed you’ve been taking the time to explain yourself in your comments. I enjoy these comments and actually learn something from them. But I have to agree that your “usual drive by crypto-obfuscation-opinions without data” are annoying. Please continue your recent trend of taking the time to explain yourself. I think most of us here prefer being enlightened as opposed to annoyed. Congress is in session in the winter and in recess during the Summer. Therefore more hot air in Winter vs Summer. Ah well, as roy spencer points out you can’t compare different networks using ABSOLUTE temperature unless you account for the differences in sampling: like altitude. — Splicing a thermometer based temperature construct onto a one largely built with treenometers. –Combining treenometers, cavenometeters, coralnometers,sedimentary layernometers etc. to create a proxy based temperature record and claiming the average absolute temperature today is clearly warmer now than it has been for 2000 years. Does reporting “averages” to 4 place accuracy, with measuring devices with 2 place accuracy, make ANY sense? Thinking more about it, sun angle/shading would only account for the lower COOP temps in winter, not the higher ones in summer. So the summer difference could be due to a higher COOP UHI, as the CRN stations are supposed to be all (or nearly all) “rural”. Summary: The COOP network as a whole has a higher UHI bias at all times than the CRN network and so would read higher in all seasons, except that some poorly sited COOP stations drag down the COOP average in winter because of shading. A physical reason CRN average > COOP average in winter.<in summer? Siting issues would tend to the winter values being greeter for coop. When are you gonna tell? NOAA CRN Temperature sensors are mounted at 10 ft (http://www.ncdc.noaa.gov/crn/sitedescription.html) CO-OP sensors are mounted at 5 ft. Ground surface temperature has a greater diurnal range than air temperature, so a sensor closer to the ground will have great max temps and lower min temps. CRN shows the wrong kind of degrees? \sarc if needed. Otherwise credit to my account. But I have to make a guess and it’s that in the old system, the readings are taken in the dark in winter and in the sunlight in summer, so the seasonal variation is larger than when you measure frequently. It could in the right circumstances. If you make 10,000 individual measurements each to 2 dp, then provided there is no systematic bias in the measurement errors, their average is known to 4 dp. But you’d need 10,000 measurements to get that level of precision. The average of 1,000 measurements with an error of +/- 0.005 (implied by 2dp) has an error of +/- 0.00015, which is better than 3 dp but less than 4 dp. It would always be much better if everyone quoted standard errors explicitly. But there is nothing intrinsically insane about the idea of being able to quote averages of large data sets to much finer resolution than the individual measurements can be made. Errors, provided they are unbiased and independent of each other, grow with the square root of the number of observations. So the more observations you make, the more precisely you know their average. If you want to report any average temperature, you need to explain what you are averaging. If you simply average the monthly mean temperature for each station, you will get one kind of average. Observing how that type of average changes with time will be meaningless as stations are added, drop out, or become intermittent. A more useful average attempts to use the output of one or more stations to assign a temperature to everywhere (say every 100 km2) on the surface of the country and then calculate the average surface temperature. Monitoring how the average varies with time will makes sense even if the number of stations reporting changes modestly with time. One might call the former the average thermometer reading and the latter the average surface temperature. Increasingly powerful urban heat islands would raise winter temperatures. Increasing urban shade could affect highs in summer. The smaller states in the northeast are over-represented because the system was built from the states to the region to the national level. When it functions on a state by state level, each state must have enough sights to make an average, so the smaller states have more sights per square mile than the larger states. My question starts here for the meteorologists – do the northeastern states, perhaps due to humidity levels, have a history of more extreme swings in temperature from season to season? The sensors are placed on a typical 3 meter (10 ft.) instrument tower at 1.5 meters (4.5 ft.) above the surface of the ground. Locations which experience high snowfall and snow depth are given special consideration. What is the physical explanation? I’ve been waiting a weekto find out.